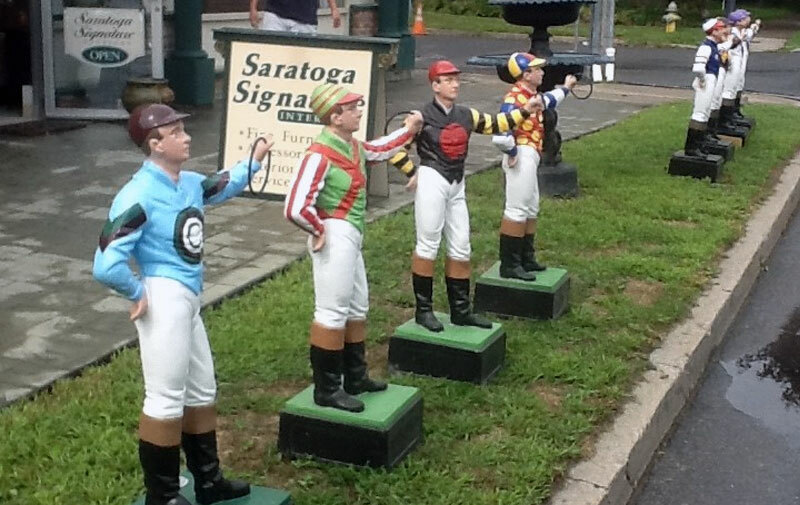 Nothing says Saratoga quite as much as a custom painted lawn jockey. When the statues are put out on North Broadway and Union Avenue, everyone knows summer is on the way. Horse owners, breeders, jockeys and horse racing fans alike enjoy the heraldry associated with these 40″ statues. Dan Czech of Saratoga Signature Interiors is the interior designer now jockey artist who paints each jockey. Registered silks are always popular but making up one of your own is fine too. The statues are 100% aluminum so can stay outside and not be effected by weather. Jockeys are shipped all over the country by UPS. 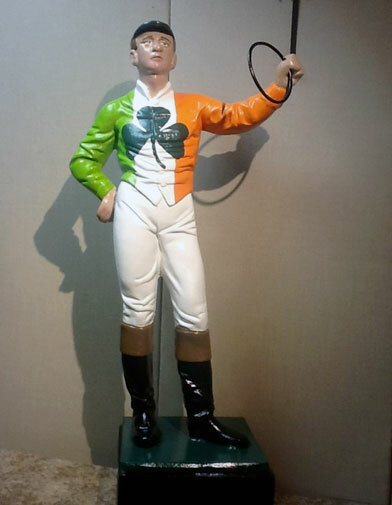 Consider a custom painted jockey as a wedding gift to the groom (or bride). Customize using your wedding colors, date on base and a gold ring instead of traditional black. He makes a great addition to any Saratoga wedding. Allow six to eight weeks for completion. Blank statues are usually in stock. However, the racing and holiday seasons are very busy for us and additional time may be needed. Look thru some of the many examples that we have painted. Do you see a favorite?